2.5" x 416' Black Resin Ribbon. Compatible with CX Series Printers. Single ribbon. Used with polyester labels. Also available as a case (Part# 12SC40001). 2.5" x 416' Black Resin Ribbon. Compatible with CX Series Printers. 24 ribbon case. Used with polyester labels. Also available as a single roll (Part# 12SC40001-R). 4.25" x 416' Black Resin Ribbon. Compatible with CX200 Printers. 24 ribbon case. Used with polyester labels. Also available as a single roll (Part# 12SC10003-R). 2.32" x 295' Black Resin Ribbon. Compatible with CodeGate2 Series Printers. 24 ribbon case. Used with polyester labels. 2.52" x 295' Black Resin Ribbon. Compatible with CodeGate4 Series Printers. 24 ribbon case. Used with polyester labels. 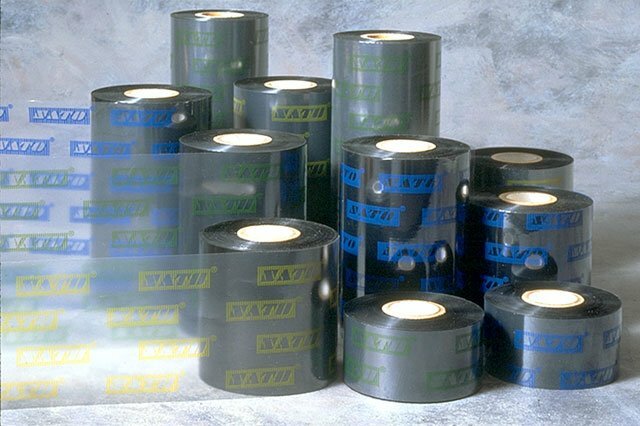 Also available as a single roll (Part# 12S000332-R). 3.5" x 295' Black Resin Ribbon. Compatible with CodeGate4 Series Printers. 24 ribbon case. Used with polyester labels. 4.33" x 295' Black Resin Ribbon, Compatible with Desktop printers and Polyester Labels, rolls/case: 24, Core Size: 0.5"
10.75" x 984' Black Resin Ribbon. Compatible with M10e Printers. 5 ribbon case. Used with polyester labels.